Located near Keystone, South Dakota, the site that is now known as Mount Rushmore National Memorial has had several names previously. Originally the mountain was called the Six Grandfathers by the Lakota-Sioux people. When Americans took over the land in 1878, the granite peak gained several monikers including Cougar Mountain, Sugarloaf Mountain, Keystone Cliffs, and Slaughterhouse Mountain. It was permanently renamed after New York lawyer Charles E. Rushmore visited the site in 1885. The idea to convert the mountain into a national monument was first conceived in 1923. In 1925 the U.S. Congress funded the project, and construction took place on the 60-foot high visages from 1927-1941. Visiting Mount Rushmore is rewarding and patriotic. Entrance to the monument is free, but there is a charge for parking. A self-guided walking audio tour is available at the audio tour building, and wheelchairs are available for check out at the information center. 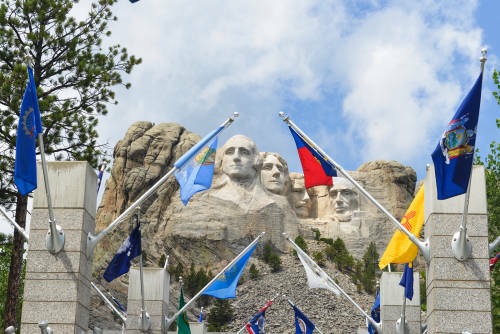 Stay under the stars at Mount Rushmore Under Canvas for an unforgettable vacation in Keystone, South Dakota. This is the perfect western getaway for families or large groups. This facility offers Lodge rooms and Multiple Bedroom cabins and activities such as horseback riding, biking, and swimming.